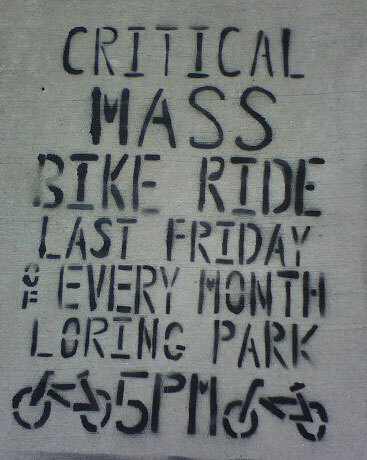 The next Critical Mass Ride is on Friday, August 29th. Meet in Loring Park near the fountain around 5 PM. Be sure to read the previous post to get an update and have an idea what to expect. On August 31st, 2007 hundreds of bicyclists participating in a Critical Mass ride were attacked by the cops. During the ensuing police riot, bikers and bystanders alike were thrown against vehicles and arrested for simply asking questions. Bikers were tackled from their bicycles without any order being given for them to stop. Those who were documenting the event with cameras or other recording devices were singled out and intimidated or arrested. Personal property was destroyed, police cars were recklessly driven straight into groups of bicyclists, people were thrown to the ground, billowing clouds of chemical irritant were sprayed, pain compliance techniques were deployed, and tasers were used on unresisting people already on the ground in handcuffs. The initial police presence included undercover officers, three marked squad cars which menaced the group throughout the ride, as well as a state patrol helicopter following overhead. Prior to the ride the Ramsey County Sheriff’s Department briefed the cops about the supposed plans of RNC protestors that were participating in the mass and falsely told them to expect violence or property destruction on the ride. After police arrested a cyclist for “riding in a snake-like way” cyclists encircled the arrest chanting “What’s the charge?” and “Let him go!”. Dozens of police officers responded to a call for help and swarmed in on the 8.31.07 Critical Mass, escalating the situation, causing chaos, and terrorizing innocent bikers. The officers haphazardly arrested a total of 19 people (3 of them minors, another an unassociated bystander) and sent them to be booked on the charge of “Probable Cause, Intent to Riot”. Although a spokesperson for the Minneapolis Police Department initially said that the police response had nothing to do with the RNC this claim was later contradicted by the sworn testimony of officers at the trial of one of those unlawfully arrested. Of the 19 who were arrested on allegations ranging from assaulting a police officer, to fleeing arrest, two plead out on reduced charges of minor traffic violations and paid a small fine. For 16 others, the city dropped their charges due to a lack of evidence. Gus Ganley’s case was the only one to go to trial. Gus faced charges of Forcibly Resisting Arrest, Assault on an Officer and Fleeing Police – serious charges for the city to bring against him. The city dragged him and 8 jurors through a trial that lasted an entire week. During the trial, video and photographic evidence taken by other participants played a key role in making it obvious that the officers involved were lying about what had happened that day when they threw Gus to the ground. The jury deliberated a little more than 5 minutes to come back with a verdict of NOT GUILTY on all of the charges the Gus faced. As it stands no known disciplinary action has been taken against the officers who lied under oath about their actions. Thank you to everyone who supported the arrestees throughout this skewed legal process, donated, and who continues to ride in the mass. Although it’s wonderful that our fellow riders who were arrested last year have been cleared of the false allegations with which they were accused, it would be unwise to forget about what has happened. Like it or not, the upcoming August Critical Mass (the one year anniversary of the police riot described on the first page of this flyer) will occur just days before the beginning of the 2008 Republican National Convention (RNC) in St. Paul and Minneapolis. There is strong evidence that last year’s Critical Mass crack down, and the increased police presence at rides since then, have been orchestrated by the Minneapolis and St. Paul police as a test run for their operations during the RNC. And just like last August there’s a good chance the cops will be looking to create trouble in order to practice on riders. Targeting Critical Mass is a common tactic for cops who view a leaderless event as a conspiracy. For example, at the last Republican National Convention in 2004, Critical Mass in New York City was the object of police violence and repression. That Mass had 5,000 to 6,000 riders who wanted to ride their bikes in the days leading up to the RNC. But the cops, who didn’t care at all about the rights of cyclists to ride together, treated the Mass like a criminal enterprise, arresting 264 riders, confiscating bikes, and violently abusing riders, all in the name of RNC security. This action led to a lawsuit by bikers who were unlawfully arresting, suing the city and the Police Department for $5 million in damages, each! Given the manner in which police handled the 8.31.07 Critical Mass in Minneapolis, the history of attacking the Mass at Republican Conventions, and the hysteria in the local media about the upcoming RNC protests on September 1-4, we think it very likely that no matter what we do, Critical Mass may well be a target of police repression this August at the one year anniversary of the 8.31.07 police riot. -Now that the criminal cases against riders have been resolved IN OUR FAVOR, continue to apply pressure to the Minneapolis City Council and the Police Oversight Board to demand that the police finally be held responsible for their violent, unwarranted, and illegal actions. Let your local police officers know that you don’t appreciate them lying under oath. -Know your rights and exercise them. Attend one of the workshops that will be held this summer in preparation for the RNC and educate yourself and your friends on how to survive and resist police violence and oppression. Coldsnap Legal Collective, the MN National Lawyers Guild, and Communities United Against Police Brutality will be offering many trainings. -Don’t be intimidated in the face of oppression. Each of us has the obligation to follow our consciences and stop violence when we see it. Participate in the mass and hold the police accountable for their actions. Posted on April 25, 2008 | Comments Off on Two remaining cases, what can YOU do? The City Attorney’s office is acting as a political tool for the Minneapolis Police Department and the City as it willingly serving their interests at the expense of the residents of Minneapolis. Instead of going after the police who planned and instigated a riot situation on 8.31.07, they are prosecuting the victims of police violence. This was painfully apparent in Gus’ trial, where the only evidence that the city felt that it needed to bring charges against Gus was the clearly fabricated story of a single officer. It was up to Gus and his attorneys to provide the mountain of evidence to prove his innocence. Though officer Craig William’s (#7769) story has been proven to be false by video and eyewitness testimony, it is highly unlikely that the City Attorney will ever prosecute him for perjury. Instead, the city is hell-bent on prosecuting the two remaining riders for crimes they didn’t commit based solely on the intentionally falsified reports of the police officers involved. Gus had to go through months of worrying, a week of his life was taken away, and he lost thousands of dollars in the legal proceedings. This shouldn’t have to happen to anyone else! The city needs to be pressured to drop the charges against the remaining two riders in the Critical Mass ride. Call the City Attorney’s Office at (612) 673-2010 and ask to speak with Susan Segal, the city attorney. Let her know that leveling charges against the critical mass participants for political reasons is wrong and the flimsy charges should be dropped immediately. Call or email your city council member (especially Gordon, Lilligren, Schiff, Glidden, Remington, or Hodges) or the mayor and let them know that you expect them to take a stand against police abuse and demand that they express their disapproval of these prosecutions to the City Attorney. You can also request a meeting with your council member to talk about the cases. The city council has to rehire the City Attorney every three years and has the authority to remove them early if necessary. Comments Off on Two remaining cases, what can YOU do? Posted on April 15, 2008 | Comments Off on Critical Mass Trial – Day 5 – Not Guilty! Comments Off on Critical Mass Trial – Day 5 – Not Guilty!